What other two feasts are connected with Passover? What were the three items required in the original Passover ceremony? In the modern observance of the Passover, what are the six items on the Seder plate? And what do these items represent? Karpas (usually parsley or celery) & Salt Water- Commemorates their ancestors who shed tears during the years they were slaves in Egypt. Not mentioned in the book is an egg that is also often found on the seder plate. This is a symbol of mourning to many Jews and a symbol of new life in Christ to believers. What does the term “2000-year-old traditions,” refer to? As they continued to celebrate the holy days after the time of Christ, the Messianic Jews understood that they were fulfilled by the Messiah, and so they began to add traditions to the feasts that continue to this very day. While the Messianic Jews are celebrating in this way, the observant Jews are also celebrating these same traditions, but where the Messianic community sees the symbolism of Christ within this feast, traditional Judaism interprets them differently. What event does the term Passover refer to in Exodus 12:12-13? The night when the angel of death passed over the homes marked by the blood of the lamb. How is Jesus the fulfillment of this event according to the scriptures? See 1 Peter 1:19-20 and 1 Corinthians 5:7. The blood of Christ was shed for mankind, saving us from the judgment of sin and death. The lamb in the story of Exodus was merely a shadow of that perfect lamb, and all who put their faith in His blood. What yearly tradition involving the high priest took place on the 10th of Nissan? And how does this relate to John 12:12-15 and Luke 19:37-40? Every year, 4 days before Passover, the High priest would choose a lamb for the people of Israel. Thousands would gather to watch as an entourage of priests made their way from Herod’s temple, through the North gate, and outside the city. Lining Damascus street, the priests would wait for the return of the high priest. When the high priest arrived, they would shout, “Hosanna to the Highest! Blessed is he who comes in the name of the Lord!” Thus signifying that the high priest had returned. What were the three feasts of the Lord that required a pilgrimage to Jerusalem? And which one is mentioned in Zechariah 14:16-19 that will take place during the Millennial Reign? How many days would a Jewish household be required to take care of the lamb in their home? And what was the purpose of bringing the lamb into their home? 4 days. There were two reasons that the lamb was brought into the home. One was to inspect it to ensure that the lamb wasn’t ill or blemished in any way. The second reason is so that they would bond with the animal and come to understand the gravity of sin and sacrifice. What might be the equivalent to this inspection as it related to Jesus the Lamb of God? See John 18:19-24 and Mark 14:53-65. The high priest, the chief priests, the elders, and the teachers inspected Jesus, looking for evidence so that they could put him to death, but they did not find any. He was perfect in every way. In Matthew 27:46-50 what took place? And what is the significance in relation to the Passover ceremony occurring at the temple that very same time? What takes place in the preparation for the Passover meal? How does this relate to a believer’s life? In preparation for the Passover meal, the Jews to great lengths to ensure that every trace of leaven is removed from their home. What are the four cups of the Passover meal? And what significance do they play in relation to a believer’s faith? We have eternal redemption through His blood. Before entering the most holy place of the temple the priest would wash his hands and feet. Jesus also washed His disciple’s feet during the last supper. What was the important spiritual message taken from this? He has washed us with water through the Word to present us to himself as a radiant church, without stain or wrinkle or any other blemish, but holy and blameless. What are the four questions that the youngest child asks during the Passover? On all other nights, we eat chameitz [leaven] and matzah. Why on this night, only matzah? On all other nights, we eat all vegetables. Why, on this night, maror [bitter herbs]? Explain in your own words what the three matzah breads mean. And what does the Afikomen illustrate about Jesus? The three pieces of unleavened bread represent the Father, Son, and Holy Ghost. The middle piece represents Jesus Whose body was broken for us. When one of the pieces if wrapped in a linen cloth and hidden away, I’m reminded of the death and the burial of our Lord. He is then found again, just as He was that morning He rose from the dead. That was amazing!! Thank you for sharing, it was very clear and so helpful. Love this resource!! This was awesome! I’ve learned some much! 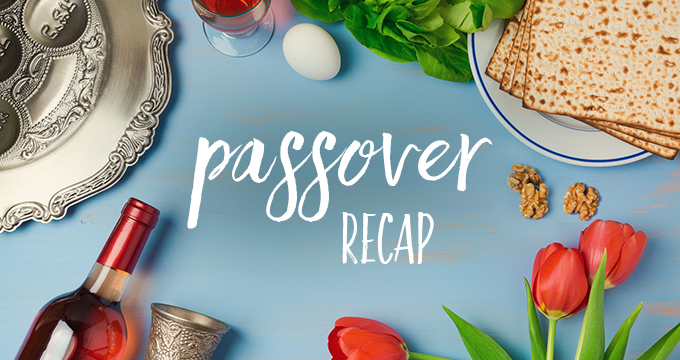 I knew that Jesus was our Passover Lamb, and I knew about the origin of the Passover feast, but I had no idea how much it was a foreshadowing of Jesus’ life. For instance I didn’t know that they killed the Passover lamb at the same time as Jesus died on the cross. This study helped to clarify and commit to understanding the Passover. I’ve re as about it all.my life, but now have a much clearer grasp of its importance in Jewish life, as well as the history of God’s people who were spared in the Passover. Thank you and Daniel ‘s time to researching on this subject. I realized how difficult to put this topic together for us plain folks to read, study and an eye opening with the time line.I have heard ere and there but not on a time line as Jesus faced and lived in this ordinarily planned life for us. Also greatly appreciated to provide captioned on the videos. THANK YOU! I loved the first video! I’m catching up and I love how you & Daniel have made things so much clearer..certainly I’ve grown up in church & am familiar with this, but you’ve both clarified it so well. I’m extremely excited about the rest of this study! Thank you so much for your time & effort so we may enjoy & continue to learn.